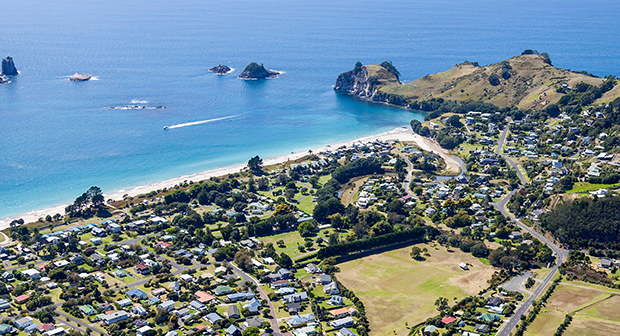 Auckland, 2 May 2015 - One of New Zealand’s most-loved summer holiday destinations, Hahei Holiday Resort, on New Zealand’s picturesque Coromandel Peninsula, has come onto the market for the first time in over 50 years. Marketed on behalf of Hahei Holidays Limited by John Bedford and Warren Hutt of CBRE, the 6.79 hectare Hahei Holiday Resort - which comprises a significant part of the beachfront and land behind Hahei beach - is offered for sale as a Freehold Going Concern property by way of International Expressions of Interest, closing for offers on Wednesday 10 June at 4pm. Bedford says that for more than 50 years campground founders Dawn and Vaughan Harsant and their family have offered the Hahei Beach Resort as a place for families and friends to connect, relax and unwind. “The family feel truly privileged to have been able offer such a special place to the public for so long, and they know how strongly connected people feel to this wonderful place. However, after 50 years of ownership and investment, and following the sad death of Dawn Harsant last year, the family are looking for new owners to continue improving and invigorating this well-known and loved destination. Warren Hutt says that the resort operates as a successful holiday and tourist business for more than 50 years. Hutt adds that site’s current zoning and structure plan provide an opportunity for further enhancement to cash flows through the potential for subdivision and the opportunity for future development of conference facilities and additional villa accommodation. The property comprises 6.79 hectares of freehold land treated as one but split over two freehold titles. The property offers 438 metres of beach frontage, behind which Hahei Holiday Resort currently offers visitors the opportunity to stay in newly-built beachfront bungalows, villas, studios or in more cost-effective cabin motels or to relive the kiwi summer dream in numerous camping and caravan sites. In addition to accommodation, the resort provides facilities and infrastructural improvements include bore water supply. Electric, LPG and diesel boilers for hot water supply and a sealed internal road network. Upgraded fast broadband has been newly installed in Hahei. “With its huge frontage to the white sandy beach, Hahei Holiday Resort is an idyllic and hugely popular Coromandel beachfront property,” says Bedford. “The entire property is predominantly flat, with a gentle slope towards the east and elevation to the northern boundary towards the beach and sand dunes. The eastern boundary of the property fronts directly onto the Wigmore Stream, with an esplanade reserve separating part of the property from the stream. Situated on the eastern seaboard of the Coromandel Peninsula in New Zealand’s North Island southeast of Whitianga between Cooks Beach and Hot Water Beach, the property is easily accessible from Auckland. “Hahei is a well-known and loved destination for both domestic and overseas travellers and is an easy drive of just over 2 hours from Auckland,” says Hutt. “Hahei village is only 500 metres away from the resort and offers a popular mix of art galleries, tourist shops, convenience retail, cafés, restaurants and a local brewery. The central location of Hahei on the Coromandel Peninsula makes the area appealing to the tens of thousands of tourists who visit each year to experience the neighbouring world-renowned Cathedral Cove and nearby Hot Water Beach, plus the many magnificent boating, diving and fishing activities on offer.